The superintendents of five southwest Alaska school districts have signed two joint letters that outline potential impacts of Gov. Mike Dunleavy’s proposed education cuts to their schools. Igiugig High School, in the Lake and Peninsula Borough School District. Gov. Mike Dunleavy released his proposed budget in February. It would cut around 23 percent from k-12 education around the state. The governor's cuts are aimed at balancing the state budget, but many educators have pushed back. In March, the superintendents of five southwest Alaska school districts authored two letters that illustrate a bleak future for their communities if those cuts come to pass. The signatories were superintendents from the Bristol Bay Borough, Lake and Peninsula, Unalaska, Southwest Region and Dillingham school districts. 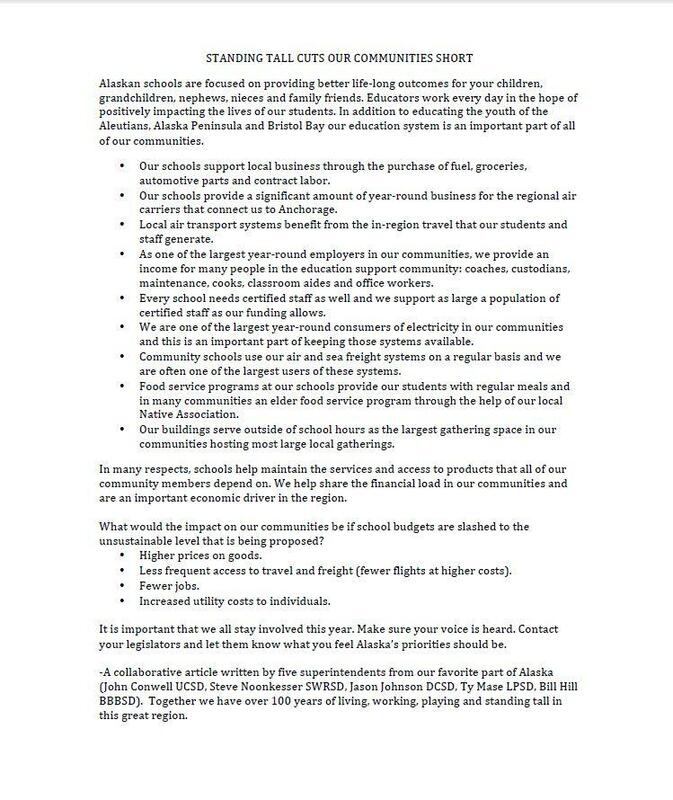 The letters begin with the headline “Standing Tall Cuts Our Communities Short,” referring to Dunleavy’s motto of “standing tall.” They are meant to rally support for education while the legislature debates the budget this session. The first letter focuses on the direct effect this would have on the learning environment. One of the starkest figures is the districts' combined loss of almost $6 million to the foundation formula, in addition to a loss of $30 million in statewide one-time supplemental funding. According to the authors, that would likely translate to restricted extracurricular programs like athletics, and fewer jobs outside of the classroom, such as coaches, custodians and maintenance. “While teacher positions will undoubtedly be cut, sadly the bulk of the cuts will fall heavily on the outliers that make our schools well-rounded, enjoyable places for our children to be,” it states. 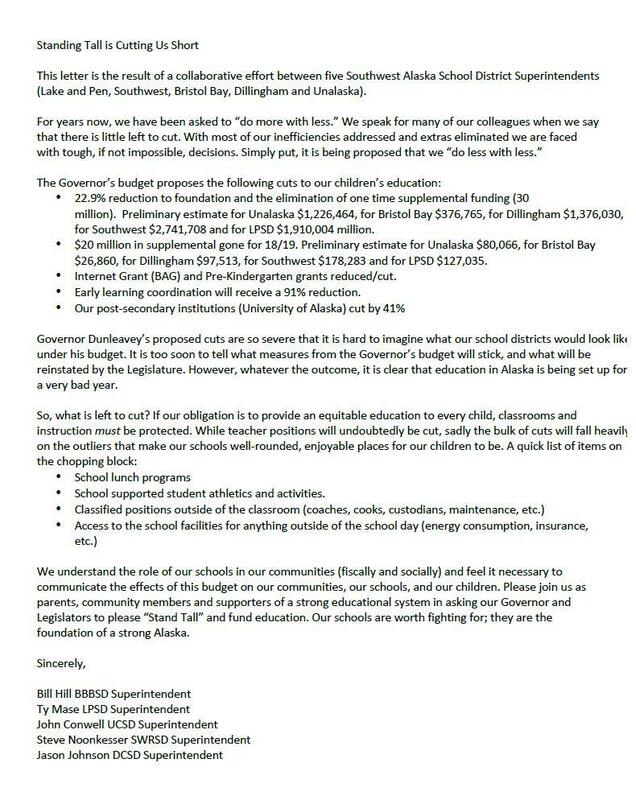 The superintendents’ second letter lays out how the cuts could reverberate throughout rural areas. Specifically, they point to the role of schools as gathering places in many villages, as well as the overall economic benefits educational institutions bring with them. The govneror recently conducted several forums on the budget in communities around the state. In the past, he has emphasized the need to close the budget deficit and pay back full Permanent Fund Dividends. The school districts are sending representatives to Juneau to discuss the proposed cuts with lawmakers on April 5.